The gray jay (Perisoreus canadensis), common in Interior Alaska, is always happy to accept a handout. This fluffy gray bird in a black and white cap quickly learns that humans are an excellent source of food, even coming to the hand for a bit of bread or cheese. Such familiarity has earned it a long list of nicknames. In addition to the once official ‘Canada Jay,’ it is called the lumberjack, meat-bird, camp robber, venison-hawk, moose-bird, and gorby. But its most notable colloquial tag, ‘whiskeyjack,’ is a corruption of an aboriginal name, wisakadjak, a mischievous prankster from Algonquin mythology. Scientists at the Algonquin Provincial Park in southcentral Ontario have been studying the gray jay since the 1960s, and their research has uncovered many fascinating aspects of this bird. Gray jays may be quick to beg for—or filch—a scrap, but they don’t just wolf it down. They fly off to cache their plunder—along with thousands of other bits of food—behind flakes of bark, under tree lichens, or in any other crevice that won’t be covered in snow later on. To make sure the food stays put until needed that winter, the birds coat it with extra sticky saliva from their enlarged saliva glands. 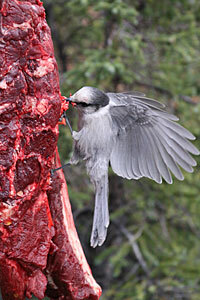 Because they depend on stored food for winter survival, gray jays live in permanent year-round territories. They even nest during months that are still considered winter in the far north. They begin building the new nest as early as late February, eggs are laid in March, and the nestlings are ready to fly the nest in May, well before many migratory birds have returned to the area. 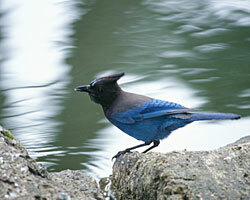 The Steller’s jay (Cyanocitta stelleri) is common in Southeast and Southcoastal Alaska. Like other jays, Steller’s jays are bold, inquisitive, intelligent, and noisy. They explore the forest canopy with measured wing beats, coming to the forest floor to investigate and look for food, moving with decisive hops of their long legs. A large, dark blue jay with a conspicuous crest, Steller’s jay has a harsh, scolding call. An excellent mimic with a large repertoire, the Steller’s jay also imitates other birds, as well other creatures like cats, dogs and squirrels.